Old medications — expired, unused, unwanted, discarded pills, tablets, creams, lotions — continue to be an ongoing, everyday problem in Northeast Ohio. If you flush them, they contaminate the local water supply and give your neighbors unsuspected doses of narcotics, hormones, antibiotics, steroids, and other potentially dangerous substances. Until recently, safe disposal of old medications has meant waiting for the U.S. Drug Enforcement Administration’s National Drug Take-Back Initiative. Now, however, rather than waiting for the next National Take-Back Day, Cuyahoga and Lake County residents have much better options. Under the new Sheriff’s RX Drug Drop Box Program, Cuyahoga County residents can deposit unused, unwanted, or expired prescription drugs at drop boxes located at participating local law enforcement agencies across Cuyahoga County. The Sheriff’s RX Drug Drop Box Program accepts prescription drugs except needles and liquids. Click here to find Cuyahoga County drop boxes for your location, and click here more information about the program. Click here for information about disposing of other unwanted medications, including needles, liquids, and over-the-counter preparations. 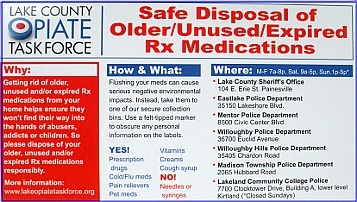 Lake County residents can take their unused, unwanted, or expired prescription and over-the-counter drugs to one of the seven Lake County Opiate Task Force drug disposal drop-off bins. For more information about the Lake County program, including drop box locations, operating hours, and accepted materials, see my May 27, 2012 blog post. Lake County residents can obtain refrigerator magnets listing drop box locations and accepted materials from the News-Herald reception desk (map) and the Mentor Discount Drug Mart pharmacy department (map).